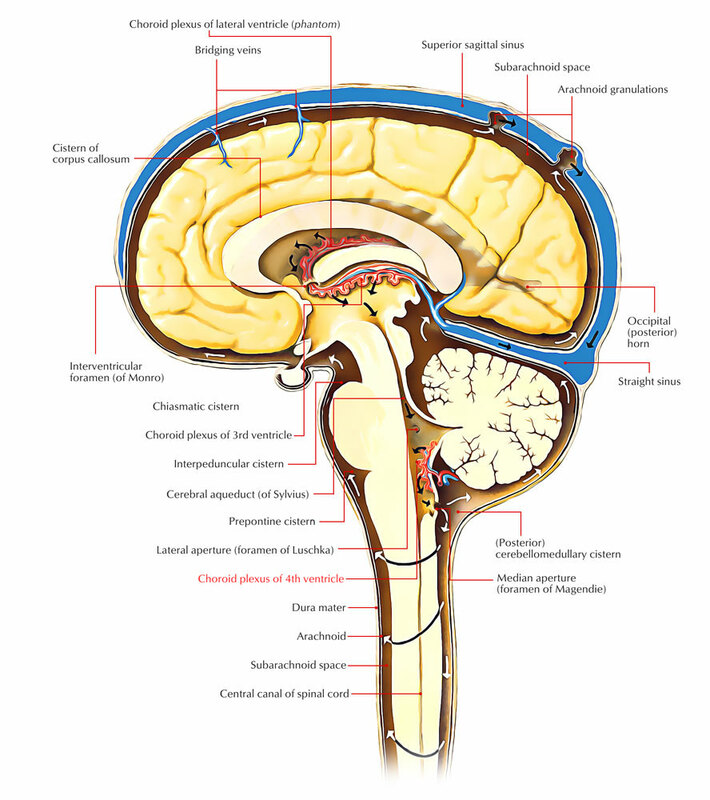 The choroid plexus is a cellular plexus that creates the cerebrospinal fluid inside the ventricles of the brain. The choroid plexus is made up of modified ependymal cells. The origination of this term is from the Greek language, where “khorion” means “membrane covering the fetus” and “plexus” stands for “network”. 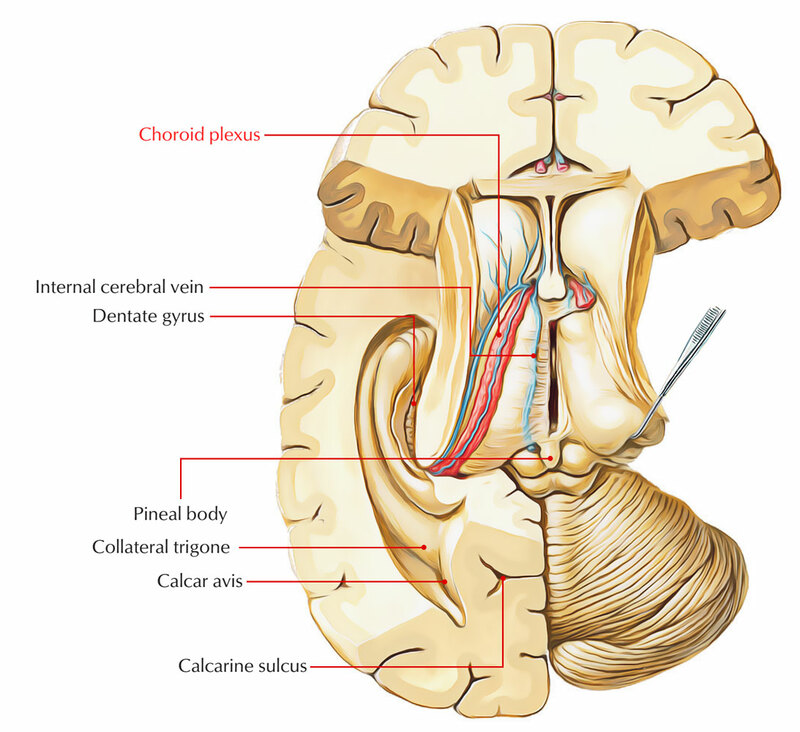 The choroid plexus is limited to a small area to the border of the brain ventricles, in charge of giving a partial transport for immune cells along with specific agents to go inside the brain parenchyma. The choroid plexus is the primary source of cerebrospinal fluid, which functions as a fluid cushion as well as a medium for nervous system excretion in vertebrates. The choroid plexus is a cluster of capillaries which, through the lower part of its roof, protrudes within the cavity of the 4th ventricle. A branch of posterior inferior cerebellar artery circulates blood to it. The total plexus is ‘T-shaped’, with foramen of Magendie occurring in the middle of the two limbs where the vertical limb of ‘T’ is double. The horizontal limb of plexus on both sides extends within the lateral recess and afterwards protrudes via the lateral aperture, the foramen of Luschka within the subarachnoid space, and is visible near the flocculus of the cerebellum, on the surface of the brain. The tela choroidea inside the top of the 3rd ventricle is triangle shaped. Like two longitudinal anteroposterior vascular borders, the choroid plexus of the 3rd ventricle suspends downward from the tela choroidea. The villous structure is made up of multiple capillaries that are scattered by choroid epithelial cells. In order to enable the active transportation of few important substances, cerebral fluid immerses the ependymal cells. Four such vascular portions are present in the brain and a sheet of cuboidal epithelial cells encircling the central capillaries and connective tissues creates all of them. The ventricles along with the epithelial cells are bordered by the ependymal layer of cells. Since these membranous tissues are adhesive nature wise, to a large number of unessential molecules the layer functions as a barrier. In order to form finger-like processes, the nerve complex goes through folding and attaches the ventricles. For increasing the surface area of the plexus, the hair-like projections are vital. 500 ml of cerebrospinal fluid per day is formed by the modified ependymal cells of the vascular membrane. In order to screen out the metabolites, foreign particles and other toxic products, reprocessing of the spinal fluid is done constantly. By sifting the plasma via the fluid with the help of epithelial cells, the nerve plexus functions as fine blood- cerebrospinal fluid barrier. The vascular structure which has the ability to transport sodium, chloride and bicarbonate ions into the ventricles and preserves an osmotic gradient properly. By removing the excessive amounts of neurotransmitters found within the cerebrospinal fluid, it controls the external environment of the brain. Within choroid plexus of the brain Choroid plexus cysts are cysts that appear generally. Ventricles are compartments or spaces within the brain, together with the choroid plexus, which is a spongy layer of cells along with blood vessels. A vital process of generating cerebrospinal fluid is carried out by choroid plexus. The ventricles are occupied by the fluid formed via the cells of the choroid plexus and afterwards in order to give a cushion of fluid; it runs around the brain as well as the spinal cord. Like a blister, through the fluid trapped inside this spongy layer of cells within this structure Choroid plexus cysts can be created. 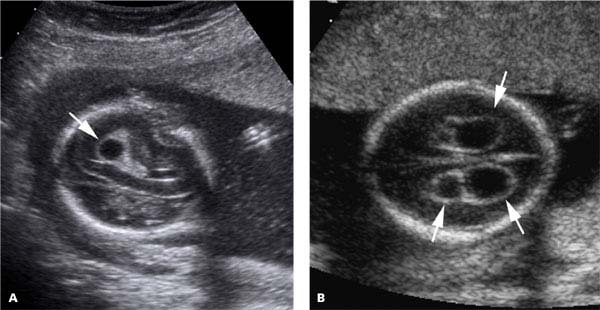 Choroid plexus papillomas can occur in both the pediatric and adult individuals and are considered a rare, benign neuroepithelial intraventricular tumour. However it is more common in fetal stage and in early childhood. Using imaging diagnosis these tumours are detected, generally within the fourth ventricle in adults and inside the lateral ventricles in the paediatric population. Generally, they appear with vivid leaf-like progressive pattern as a solid vascular tumour. Dotted calcifications are found in a quarter of cases.